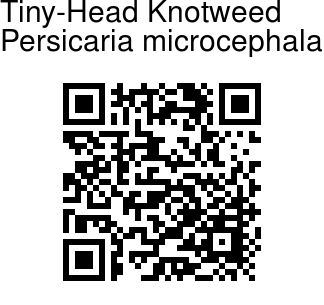 Tiny-Head Knotweed is a perennial herb with stout rhizomes and erect or decumbent stems, 40-60 cm tall, angulate, branched. Flowers are borne in a head at branch-ends, 5-7 mm in diameter, flower-cluster-stalk hairless or glandular hairy; bracts ovate, tip pointed. 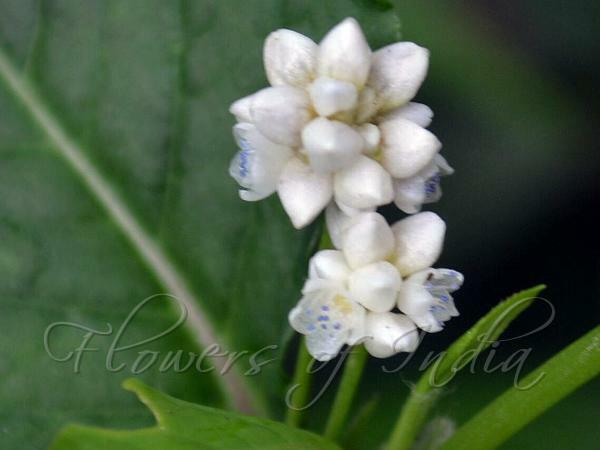 Flowers are white or pinkish, 5-parted; tepals elliptic, 2-3 mm. Stamens are 8, included, styles 3, fused to below middle; stigmas head-like. Leaf-stalks are 1-1.2 cm, winged; leaf blade broadly ovate or triangular-ovate, 6-10 x 2-4 cm, both surfaces hairless or hairy, base subrounded, decurrent along leaf-stalk forming a wing, margin entire, fringed with hairs, tip tapering; ocrea tubular, lax, 7-10 mm, velvet-hairy, tip flat, fringed with hairs. Seed-pods are black-brown, opaque, broadly ovoid, trigonous, 2-2.5 mm, dotted. Tiny-Head Knotweed is found in Bhutan, NE India, Nepal, Sikkim and China, at altitudes of	500-3200 m.
Identification credit: Ritesh Kumar Choudhary Photographed in Soureni, Mirik, West Bengal.